Jobs in data science abound, but few people have the data science skills needed to fill these increasingly important roles in organizations. 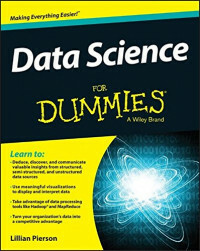 Data Science For Dummies is the perfect starting point for IT professionals and students interested in making sense of their organization’s massive data sets and applying their findings to real-world business scenarios. From uncovering rich data sources to managing large amounts of data within hardware and software limitations, ensuring consistency in reporting, merging various data sources, and beyond, you’ll develop the know-how you need to effectively interpret data and tell a story that can be understood by anyone in your organization. It’s a big, big data world out there – let Data Science For Dummies help you harness its power and gain a competitive edge for your organization.